I haven't baked a lot of crumb toppings, though I have made a few, and of them this one is the first and best I've made. Sometimes it breaks into big chunks, sometimes little ones; but it's always crisp, crunchy, and crumbly. It's not too sweet and hits you with just a hint of cinnamon goodness. This crumb topping is almost like having a nice oatmeal cookie baked on top of your pie. What more could you want? Adjustments should be made depending on the filling you're using. If your filling is on the sweeter side, consider reducing the sugar a bit, otherwise keep it as is. Being someone who likes things a little less sweet, I obviously lean towards the former. 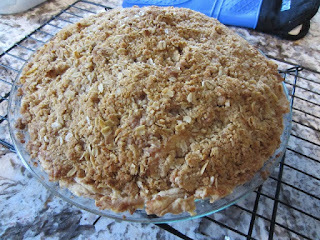 In the end, whether it's apple pie, blueberry pie, strawberry pie, peach crumbles, pear crumbles, whatever; I really do think this crumb topping is a great pairing. And that's just the way that crumb top crumbles. In a medium bowl add oats, flour, cinnamon and sugar and whisk until combined. 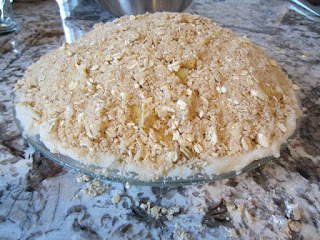 Add butter and using a pastry blender or two forks, cut the butter into the dry mix until crumbly. Top pie or crisp with crumb topping and bake per recipe instructions. I've always loved crumb toppings and think they get overlooked because of the obsession with the perfect 'double crust.' I bet the topping would be great 'straight up' on ice cream, too! Ice cream? That has never occurred to me :). Holy jeez; mind = blown :). In my family crumb toppings are probably preferred over the double crust. For me it's a mood thing. If anything, I love them because they're so much easier to make :).